The Cornell University ILR School’s New York City conference center is located at 570 Lexington Ave. in midtown Manhattan in the historic RCA Victor Building. Our conference center offers a unique and professional atmosphere for hosting your business or educational event. We are dedicated to helping you meet your goals by providing the highest level of professional service. Not only will your guests be impressed with the event but your planning process will also be stress free! Every meeting space in our New York City venue is equipped with integrated technology and projections systems at no additional cost. The ILR Conference Center is committed to supporting our Cornell communities, area businesses, associations and organizations by providing quality, affordable facilities, innovative technology and personable service. Parking is available in New York City area parking garages at varied rates. The ILR Conference Center in downtown New York City offers 86-inch touchscreen displays in each meeting room, ceiling projectors and drop-down screens, two 49-inch displays on columns for visual aids (largest meeting room), cameras (instruction, participant), ceiling microphones and speakers, DVD/Blu-ray player, room PC, connection for laptop, and a Crestron control system. Add day beverage service (coffee, tea, water) included in room rental. We work with an exclusive caterer for breakfasts, breaks, lunches, dinners and receptions. 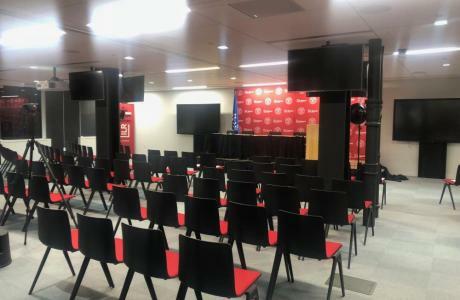 The NYC ILR Conference Center offers an inclusive room rental rate of room set-up, audiovisual equipment, basic tech support, actual event time, and clean-up. Requests for use beyond Friday at 5PM and on weekends will be considered individually. Additional labor charges of $55.00 per hour for events taking place outside of normal business hours will be incurred. Event Requirements You are required to provide the Conference Center with a list of names (first and last) for those who will be participating in your event five (5) days prior to the start date. Guests will be required to show a valid photo ID at the front entrance at 570 Lexington to gain access to the 12th floor. All visitors must report to the 12th floor Reception Desk. The receptionist will provide instructions of the location of your meeting space (11th or 12th floor). Room Set-up and Audiovisual Equipment Room set-up arrangements must be confirmed seven (7) days prior to event. Last minute changes are subject to reset fee at the discretion of the Conference Center Coordinator. Catering A final guest count is required seven (7) business days before the event. You will be billed on the guarantee count or actual attendance; whichever is greater. A guarantee may not be decreased on the day of the event. NOTE: Due to health and safety regulations, any unused food and beverage at the end of an event is the property of the ILR Conference Center and may not be removed. Event Fire Marshal Policy Events taking place Monday – Friday (8am – 10pm) The Conference Center can accommodate 99 guests on the 11th and 12th floors during M- F without being required to have a Fire Marshal onsite. Anytime there is over 99 guests for any event or for all events taking place on both the 11th and 12th floors, M-F, 8am – 10pm, a Fire Marshal is required. You will be required to pay a fee of $148/hr. with a minimum of 4 hours. Events taking place Saturday – Sunday The Conference Center can accommodate 99 guests on the 11th and 12th floors on Saturday and Sunday without being required to have a Fire Marshal. Anytime there is over 99 guests for any event or for all events taking place on both the 11th and 12th floors at any time on a Saturday or Sunday, a Fire Marshal is required. You will be required to pay a fee of $148/hr. with a minimum of 8 hours, plus an additional $15 for a meal charge. Please note: if you are the last event to be booked on any day which escalates the # of guests over 99 (regardless of the # of guests you have in your event), you will be responsible to pay the full associated Fire Marshal fee. You will be notified when booking your event if you will be assessed a Fire Marshal Fee. The client shall be entitled to cancel their event upon written notice to the ILR Conference Center in accordance with the following terms: Cancellation 60-90 days’ notice 25% of total contract value 30-59 days’ notice 50% of total contract value 8-29 days’ notice 75% of total contract value 0-7 days’ notice 100% of total contract value The Conference Center is not responsible for any lost, stolen, or damaged property belonging to the members of the rental groups utilizing the facility, and shall not assume any responsibility for injury which may occur during the use of the facility. Additional Rental Policy information will be provided upon booking your conference or event with ILR Conference Center in New York City.